TAGLINE: "Half Corpse...All Killer. 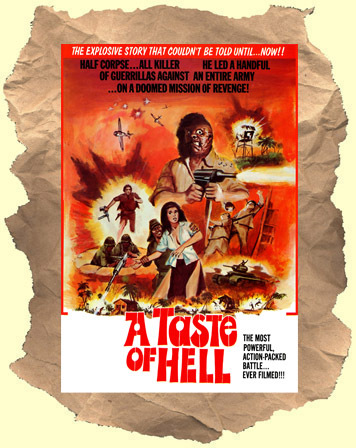 He Led a Handful of Guerrillas Against an Entire Army...on a Doomed Mission of Revenge!" More Filipino style war exploitation. John Garwood stars as a tough soldier helping out the underdog guerrillas in the jungle. Bad guy Vic Diaz manages to kill off all his men and disfigures Garwood leaving his face resembling an extra cheese pizza that someone dropped in the dirt. Meanwhile, tough guy William Smith is a soldier of fortune fighting the good fight and falling in love with a native girl. Eventually the two men join forces to take care of Diaz and his soon-to-be dead army.